Atlanta, Georgia (CNN) -- Ever since he was a child, Jasmin Bambur dreamed of going to the Olympics. In college, he played competitive handball and was close to making the national team that would take him to the big games. But Bambur's life took an unexpected turn one winter night 10 years ago, when he fell asleep at the wheel of his car. He suffered a severe spinal cord injury, making him a paraplegic at age 20. "With this accident, that dream just got crushed, and I never believed that I would be able to get to Olympics again," said Bambur, a native of Serbia. This week, Bambur has become the first Serbian to compete in the Paralympic Games, a set of elite sporting events for disabled athletes that lasts from March 12 to March 21. The competition in Vancouver, British Columbia, includes skiing, wheelchair curling and ice sledge hockey. 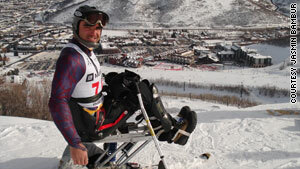 Bambur is competing for the Serbian Disabled Ski Team in a number of Alpine racing events. Watching the Paralympics on television or on the Internet helps show newly disabled people that they have the potential to become active again in a variety of recreational activities, said Dan Humphreys, sports specialist at the Shepherd Center in Atlanta, Georgia, the hospital where Bambur underwent rehabilitation for his injury. The Paralympics are "examples of the pinnacle of athletic achievement for people with physical disabilities," he said. Jasmin Bambur, injured in 2000, skis competitively. He is participating in the 2010 Paralympic Games. "What I try to do is show them, try to get them in the mindset of thinking of what's possible, not what can't happen," he said. "A lot of things that inpatients deal with is, immediately they start to think [about] what they're not going to be able to do." Bambur remembers feeling depressed during his first months at the Shepherd Center, which specializes in treatment, research and rehabilitation for spinal cord and brain injuries. Therapists explained that he would be able to play sports, but he didn't believe them. "I just told them: 'Leave me alone. I just want to not be a part of anything," he said. "I was just kind of avoiding everybody, didn't want to do anything, didn't talk much. I was kind of always in pain. It was a really horrible time in my life." His view brightened when a therapist brought a photo album of herself with her husband, who was in a wheelchair, doing everything from riding camels to skiing. Bambur didn't think much of it until the following week, when the man from the photos, a Paralympic gold medalist, came to meet him. Bambur realized that this man's disability was more severe than his own but that the medalist was "having a ball." "I was like, 'if he can do it, I can do 10 times better,' " he said. "Next morning, I was like, 'I want to go to the gym. I want to go outside and do whatever it takes.' "
The Shepherd Center sponsors 11 sports teams that allow people with disabilities to engage in activities recreationally or competitively. There's usually some type of adaptive equipment involved, such as a special wheelchair for basketball or a chair that attaches to skis. The cost of the extra equipment can be prohibitive, Humphreys said, with specialized chairs costing thousands of dollars. But the center and other organizations raise money for such equipment. Ryan Barnett, who was a professional cyclist before an injury left him paralyzed in May 2008, turned to skiing as his sport of choice after coming to the Shepherd Center. He hopes to go to the Paralympics one day and currently skis with the U.S. ski team's developmental team. Being back in elite athletics has also allowed him to develop everyday skills in terms of navigating the world in a wheelchair as he travels to competitions. He has enjoyed meeting others who have been competitive athletes in wheelchairs for decades and learning from their experiences. Unlike Bambur, Barnett said he did not feel frustrated or depressed after his accident -- he was hit by a car while cycling -- mostly because he felt so lucky to be alive. For the first part of his recovery, he did not think about athletics, but when he and his wife went to watch Atlanta's Peachtree Road Race, she suggested that he might like to try wheelchair racing. He now races and skis. "Life rolls on," he said. "It doesn't matter that you're in a wheelchair. It's really important to stay active." Like Barnett, Bambur had tried skiing before his injury but never practiced it professionally until after he became disabled. Nearly 10 months after he was hurt, Bambur went on a trip to Breckenridge, Colorado, through the Shepherd Center. It became the start of his skiing career. "I immediately fell in love with skiing because there were no more wheelchairs, and I was completely free, and I was able to do everything I was doing before. You can jump; you can stop; you don't need help from other people," he said. Bambur does not find skiing as a disabled person much different than regular skiing. Able-bodied skiers must adapt themselves to their equipment and environment, he said. "I just adapt myself further to accommodate myself to be able to ski again," he said. Barnett, though, doesn't feel like he's getting as much satisfaction out of athletics these days as he did as a cyclist, partly because he had cycled at such a high level, was more recently injured than other competitive athletes and has high expectations for himself. "It certainly gives me a lot to shoot for," he said. "It's been real fun to see my times get better and better, and certainly my racing has come a long way in the past six months. I'd like to get to the top. It'd be fun to go race all of the biggest marathons in the world." Since he met the Paralympic medalist from the photos, Bambur felt able to jump back into normal life. "I went back to school, graduated from college, got a job, married. I have a baby on the way right now," he said. "Life is still possible; it's just what you make out of it. It's not what's thrown at you."